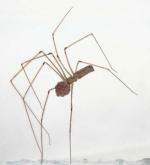 Special features: Purse Web Spiders are a dark brown colour, with greyish-white lines where the jaws meet the carapace. The carapace is very square at the front, and the legs are stocky. The abdomen in the female is generally larger than in the male, and more pale in colour. Purse Web Spiders are so called because they catch their prey from inside a sock shaped silk tube which is about 8cm long. The tube is covered with dust and tiny stones to help it blend into the surroundings. When an insect lands on the tube the purse web spider stabs its fangs through the purse into the insect and drags the victim inside. The hole in the purse is then patched up. The tube is like the tip of an iceberg. Beneath it the purse web spider has a silk lined burrow which can extend down a further 50cm. Purse web spiders belong to the suborder called 'Orthognatha' which means straight jawed. 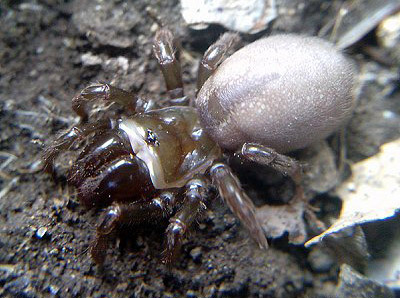 Other species in this suborder include tarantulas, trap-door spiders and funnel web spiders. Distribution: Found mainly in southern England, but also recorded further north. Habitat: Rough grassland, especially on sandy or chalky soils.